Big Data solution that predicts future demands of public services and prescribes the best locations for public centers and facilities: schools, primary healthcare centers, hospitals, city information offices, facilities, etc. Analyzing current centers and services. Forecasting future needs based on socio demographical evolution. Designing the mathematical model which optimizes the location of new centers. 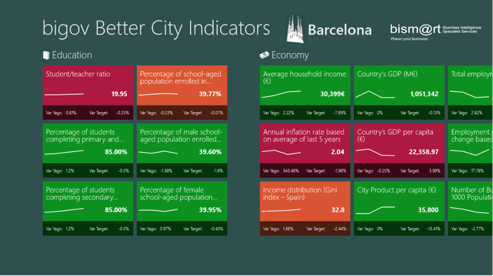 Dashboard including 120 city indicators inspired by the City Protocol Society and the 37120:2014 ISO, in order to measure the city’s level of development and to show how attractive is to live or to develop a business in it. This solution measures the city’s level of development and to show how attractive is to live or to develop a business in. It aims to help local governments to design better policies in order to improve the lives of their citizens and the business environment. Key performance indicators measure strategic goals. 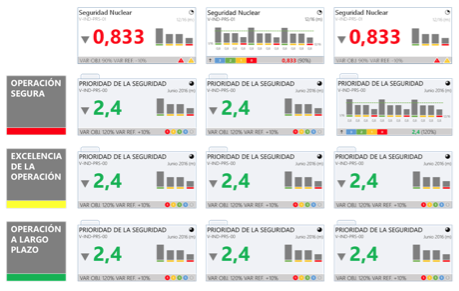 This next generation dashboard alerts us if linked indicators are degrading and could affect the strategic kpis, predicting what’s to come. Thanks to the analysis of the indicator relationships we are totally proactive. We can predict the future, risks that could be avoided/mitigated and opportunities that could be exploited. This dashboard provides timeliness of risk/opportunity focused warnings and measures.